Why do Crows Roost in Cities? At the Crowmageddon edition of Birds and Beers we watched thousands of crows coming in to roost at the edge of downtown Minneapolis. I wondered how long this had been going on. Did crows come into colonial cities at night? (Someone pointed out they probably would have been shot and eaten.) I did some digging and here's what I discovered. Crows coming into cities to roost in massive numbers in the winter is a relatively new phenomenon that started in the 1960s and increased each decade. 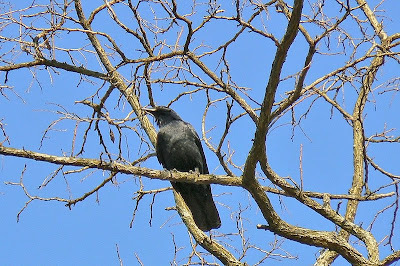 There are now many massive crow roosts around the country with populations in the tens of thousands each. Crows have always roosted together at night but it is presumed that as cities expanded, they overtook the historical roost sites that were outside the city. Crows historically avoided people but some of these birds learned that there are advantages to being in the city at night and have learned new behaviors. Crows are amongst the most intelligent birds. There's also some evolutionary selective pressure going on here. The crows that overcame their fear of humans have prospered and multiplied because of the advantages of roosting in the city while those more timid crows have not been as successful and thus not passed on their timid genes. Loring Park on the edge of downtown Minneapolis is a great example of why these roosts are successful and advantageous. First off, the park is well lit. The biggest enemy to roosting crows is the Great Horned Owl. The owls will come into a roost at night and pluck the sleeping birds out of the trees. Owls are less common in urban areas. No matter where birds roost there is safety in numbers but there is also safety in lighting. The park is lit up at night for human's safety but it makes the crows safer as well as they can see Great Horned Owls better. It is believed the heat island effect helps the crows as well. The city is warmer at night than the surrounding rural areas and warmer nights mean birds spend fewer calories staying warm. Warmth, however, is clearly not the primary concern as the crows all seem to roost at the tips of the branches in the tallest trees. This is the coldest spot in the tree but also the best place to watch out for owls. It is fascinating to see how animals are adapting to increasing human population pressures. For crows, there seems to be some advantages to living near humans, the same can't be said for most bird species.